Hi, everyone! I’m Jo. I own CutandChicVintage, an online vintage shop and blog dedicated to the modern girl with plenty of “style swagger.” The term “style swagger” was inspired by my customers who all exude this wonderful confidence about their personal sense of style. I think vintage fashion helps to bring that out in people. There’s something about knowing no one else will have the same thing you’re wearing that brings out that confidence. There’s something about knowing no one else will have the same thing you’re wearing that brings out that confidence. As for my personal style, I’d describe it as modern vintage. Oddly enough ‘modern vintage’ is a term I usually see associated with interior design, so it really does feel like kismet to be doing this post where fashion meets interiors! 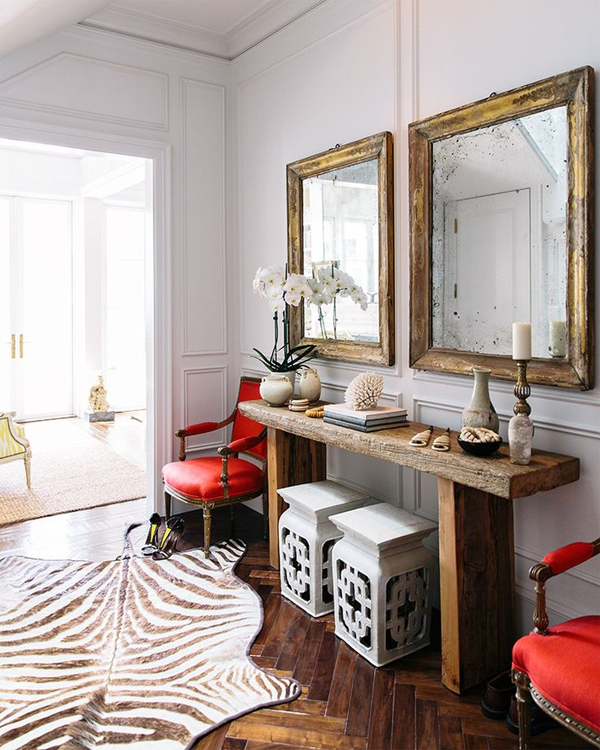 The room I was immediately drawn to was this one designed by Susan Greenleaf with beautiful pops of red. It looks like a room that’s come together with some vintage finds here and there, yet overall it’s got a sophisticated, modern vibe to it. A room after my own heart! What I love most about this space is how these bold and unexpected details are mixed in with a fresh and neutral palette. Because the rest of the room is so clean and minimal, that luxurious animal print rug and those fabulous cherry red armchairs just pop. Although you can never go wrong with buying chic basics in your home or in your wardrobe, it’s those statement pieces that really highlight your personality. Those are the pieces I love finding when I go vintage hunting. For this outfit post, this vintage ‘60s swing coat instantly came to mind. I found it rummaging around a thrift store in NYC. Its animal print collar and sophisticated cut caught my eye straightaway and it really couldn’t capture the essence of this gorgeous room any better if I tried! The vintage cashmere sweater is from Scotland. Even though it was pretty ordinary when I saw it, I just had to buy it because the cashmere was in such perfect condition. I think it’s worth investing in quality pieces that are timeless in style and that you can wear year after year. Plus, you can always dress it up later and make it your own if you get bored with it. When it came to revamping my sweater I had to give a little nod to my punk rock phase as my source of influence. I broke out an old box of safety pins and sewed them around the neckline. I have to say, I’m really pleased with how well it turned out! As for the finishing touches, I paired the sweater with an old pair of skinny jeans and my favorite pair of animal print heels. From head to toe I wanted the outfit to have a more relaxed, uptown meets downtown feel. For this shoot I borrowed the vintage clutch bag from my shop. It’s the perfect chic accessory if you’re on the go. And to top it all off, I couldn’t forget about that pop of red. No matter what you’re wearing, if you’re looking to add just the right amount of retro glamour to your overall look, red nail polish and lipstick are the way to go. A big thank you to Jacquin for this opportunity to introduce myself to you all! Feel free to check out my hand-picked collection of quality vintage fashion at my Etsy shop, cutandchicvintage.etsy.com, or come and say hello on my blog CutandChic. 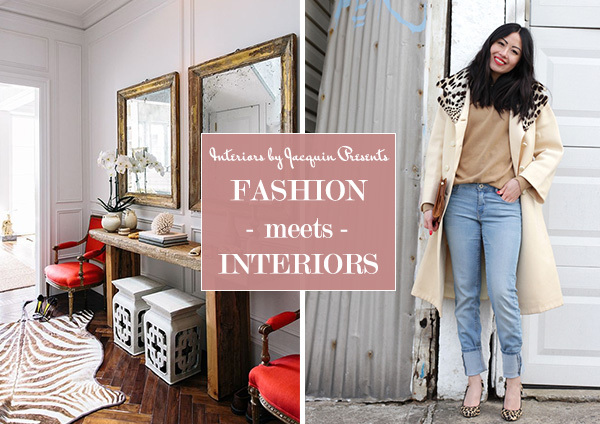 Explore more of the “Fashion meets Interiors” series on Interior by Jacquin blog!